Why it’s hard, why it’s necessary, and how to do it. Have you ever felt like you don’t have your “people?” Like you are wanting to meet others who enjoy the same activities as you, same foods as you, like to travel, try new things, have a similar story to yours? People who are on similar paths; who can understand you totally? The truth is, we all feel this way. No matter what, we can all use more friends and support in our lives! But why is making friends as an adult so hard? Throughout every stage of childhood and adolescence, we are naturally in communities. Our social structure is set up to facilitate our making new friends — we are in the same classes, sports teams, camps, extracurricular activities, and even dorms and university groups. These structures provide a natural categorization of people to be friends with. We lose this resource as adults without even realizing it. Add on the fact that most of us have so little time after work and families, and often times feel guilty about spending time fostering our own connections rather than our children’s- it is understandable why it feels difficult to make friends as an adult. But, like any goal that we desire, it takes work to make these adult friendships happen. Sometimes we feel lazy. We don’t want to make the effort and would rather hang on the couch. We also tend to “compare and despair”: We look around at others, on social media or in person, and feel like we aren’t “cool enough” or “on the same level.” There’s this unspoken social hierarchy story that we create that says that person is “higher” than us or “lower” than us, and we are scared of not being liked or accepted! Nervous to be seen as weird or less than. We all do these things. It is natural. But the truth is that these are just stories that we create to keep ourselves separate. Walls that we build for ourselves. If it feels so challenging, then why does it matter? History shows that we actually need support, communities, tribes- to survive. We as a culture come from a tribal society — we traveled together in tribes, we ate together, we lived together. We were protected by being part of, and if for any reason we were left out or left behind, our physical survival was in jeopardy. And now, while we don’t need these groups any longer to help us find food in the wilderness or defend ourselves from an opposing tribe, we do still need support for emotional and spiritual survival. And there exists significant health benefits as well. Julianne Holt-Lunstad, professor of psychology and head of a study at Brigham Young University states that, “Not having a social support network can be a higher death risk than obesity or leading a sedentary life without exercise; the studies have shown a 50% increased odds of survival if you have a solid social network.” (Huffington Post). Other studies at Brigham Young University and the University of North Carolina have found that having friends or a social support system extends life span the same way quitting smoking does and are less likely to develop the common cold. (Time). So how can we make more friends? Be vulnerable. C.S. Lewis said, “Friendship is born at that moment when one person says to another, ‘What! You too? I thought I was the only one.” When you share something about yourself with someone else, connection begins to bud. 2. Be empowered! Utilize the courage that is inside of you. Even if you feel shy and consider yourself introverted, find your style. Try talking to baristas and people you interact with every day. 3. Get outside your comfort zone. Another one of our favorite quotes reads, “Everything you’ve ever wanted might be on the other side of fear.” Be a leader in your own life- stop waiting for others to make the first move. Remember, everyone is wanting the same thing — everyone wants to have friends and be part of. 4. Be open! You never know what someone has been through or what their story is. So try not to judge a book by its cover. 1. Go to meetup.com and explore activities of interest to you in your community. Like to knit? There’s a group for that! Interested in the wonders of plant culture? Go find it! The possibilities are endless! 2. Utilize social media. Find Facebook groups of people who share your interests and look for events in your area. Click on hashtags or geo-tagged locations that are up your alley and see what comes up! 5. Decide on one or two festivals or retreats or workshops where you know you will find your people and make the commitment. 6. Come to Soul Camp! We would love to have you and help you to find the deep connections you have been wanting. Your tribe is waiting for you. Commit to doing at least one of these action steps today. You deserve it. 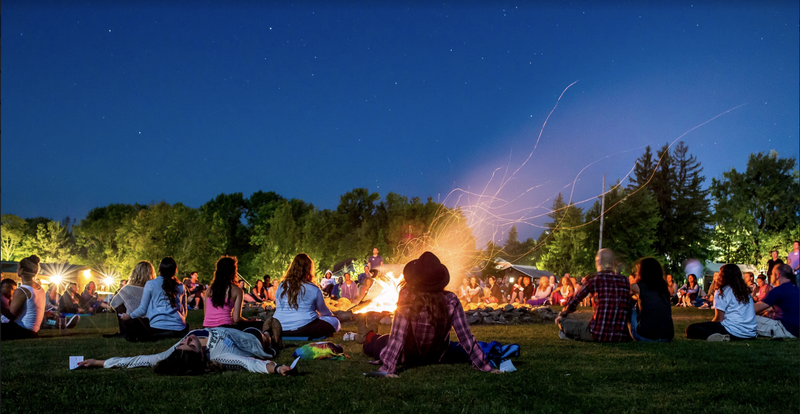 Soul Camp co-founders Michelle Goldblum and Alison Leipzig united to bring all of the things they loved together to create a completely transformative experience for both themselves and their communities. Going to sleepaway camp together as children, and now, both entrepreneurs in the health & wellness space, they saw that there lacked large-scale community experiences that were not only deep and healing, but fun and playful as well. They believe in the power of joy to change the world. And it happens, one camper at a time.